Homecare services are emerging as the top most priority in healthcare sector. Driven by aging population, increasing healthcare costs and fight for acceptance, homecare services marketing is becoming the most challenging part of healthcare marketing. 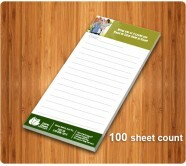 Custom homecare notepads are becoming favorable promotional choice for homecare marketers because they are the only thing which will offer them high value for investment. Personalized homecare notepads from our collection is gaining immense popularity because they offer the best of both worlds which are high customization potential for advertisers and high utility value for users. Advertisers can choose these budget friendly promotional homecare notepads printed with brand credentials and hand it out during community health fairs, sponsored health camps or they can be employed for patient reminders. Personalized home healthcare services notepads can be utilized by patients or their caretakers to scribble down important healthcare information regarding medicines or other exercising routines, doctor appointments, etc.